Throughout history, our nation has sought to find the most ethical way to deliver government contracts. In an effort to find a balance between normal expectations of government contracting and personal benefits, the government has enacted endless rules and regulations; however, those codes of ethics have not deterred government contracting employees from behaving unethically when doing their jobs. Ethical Occurrences in Government Contracting: Principled or Corrupt chronicles the notions of government contracting managers and employees regarding why unethical behaviors occur. See the similarities and differences of two groups engrossed in the same job. 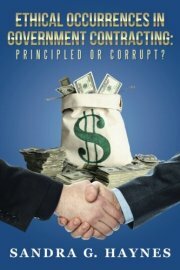 Written by Sandra G. Haynes, an acclaimed expert in the government contracting field and outlines the views of experts in government contracting, Ethical Occurrences in Government Contracting: Principled or Corrupt is an intriguing text for any individual desiring to understand how to mitigate unethical behaviors in government contracting.